Our spacious, covered outdoor studio is situated just a 5-minute walk from student accommodations, overlooking views of the sea and the swimming pool. The studio takes full advantage of the spectacular natural light for which Greece is famous. Our indoor studio and its surrounding terraces encompass over 4000 square feet. The studios are outfitted for painting, select printmaking methods, cyanotype, and simple papermaking. We consider the entire island as our art making “studio”. Most work is done out of doors whenever possible, to take advantage of the spectacular setting and perfect climate. 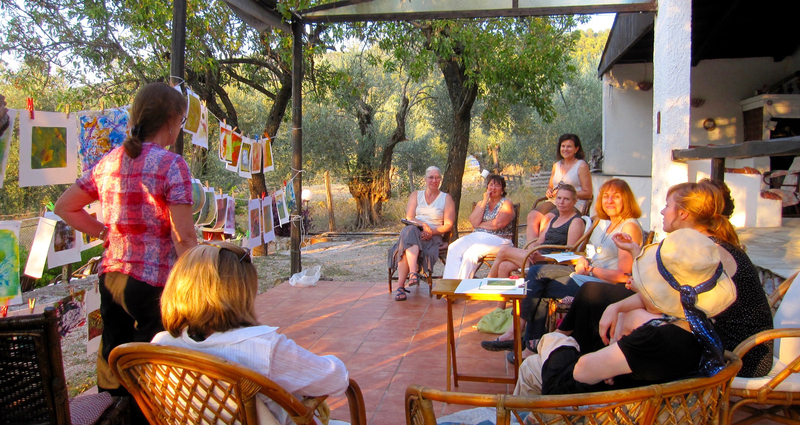 Studio time for select classes, critiques, cultural workshops and informal meetings are held in gardens, patios and olive groves adjacent to accommodations. Browse through our photo gallery to see where we work.